The AMC Anchors School runs over four sessions (two evenings and one weekend) to teach the fundamentals of building safe climbing anchors. Day 1 – Learn anchor components, anchor types, knots and hitches. AMC membership, registration, and $125 fee required – see http://arizonamountaineeringclub.net/schools/anchors-school/ for registration and payment. The AMC Anchors School complements the AMC Outdoor Rock Climbing School to provide training in all the skills necessary to enable safe top rope rock climbing. 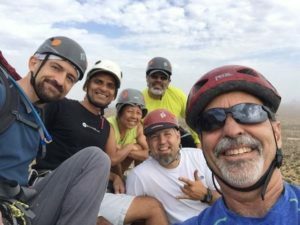 You will receive a comprehensive manual and lecture topics combined with hands-on learning, including a weekend on the rock setting real anchors in a variety of situations, followed by a fun day of climbing on those anchors.